Euston is a London Underground station served by the Victoria line and both branches of the Northern line. 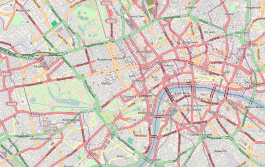 It directly connects with Euston main line station above it, the station is in Travelcard Zone 1. Euston was constructed as two separate underground stations, three of the four Northern line platforms date from the stations opening in 1907. The fourth Northern line platform and the two Victoria line platforms were constructed in the 1960s when the station was altered to accommodate the Victoria line. 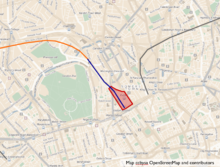 Plans for High Speed 2 and Crossrail 2 both include proposals to modify the station to provide interchanges with the new services, on the Northern lines Bank branch the station is between Camden Town and Kings Cross St Pancras. On the Charing Cross branch it is between Mornington Crescent and Warren Street, on the Victoria line it is between Warren Street and Kings Cross St. Pancras. 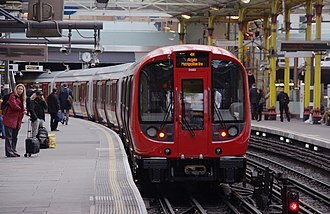 The station is near Euston Square station allowing connections at street level to the Circle, Hammersmith & City, an underground station to serve Euston station was first proposed by the Hampstead, St Pancras & Charing Cross Railway in 1891. For the remainder of the 1890s, the CCE&HR struggled unsuccessfully to raise the capital it needed to fund the construction, whilst it did so it continued to develop its route proposals. In 1899, parliamentary permission was obtained to modify the route so that the Euston branch was extended northwards to connect to the route at the south end of Camden High Street. The section of the route between the two ends of the loop was omitted. In 1900, the CCE&HR was taken over by a led by American financier Charles Yerkes which raised the necessary money. Also in 1900, a proposal was presented to parliament by the Islington and Euston Railway for an extension of the City, at the time, the C&SLR was in the process of constructing an extension to Angel from its recently opened terminus at Moorgate Street. The extension plan was initially permitted in 1901, but delays in the process meant that it had to be re-submitted the following year. 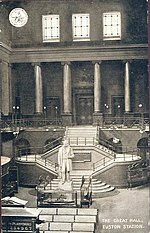 The second submission was opposed by the Metropolitan Railway, which saw the extension as competition to its service between Kings Cross and Moorgate, and the plan was rejected. Euston Square is a London Underground station at the corner of Euston Road and Gower Street, just north of University College London and within walking distance of Euston railway station. It is between Great Portland Street and Kings Cross St. Pancras on the Circle, Hammersmith & City and Metropolitan lines, the station opened in 1863 as Gower Street, changing to its present name in 1909. In late 2006 the new entrance on the side of Euston Road opened in a corner of the new headquarters of the Wellcome Trust replacing the old entrance. There is an entrance on the north side of Euston Road. In 2011, two new lifts linking the platform to the street were opened. On top of these a new entrance was opened. 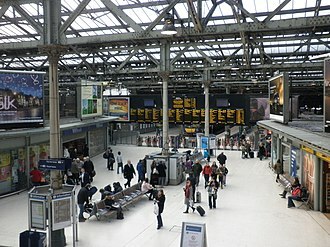 In December 2005 Network Rail announced plans to create a link between the station and Euston station as part of the re-development of Euston station. This will create a link for users of main line rail services which depart from Euston. 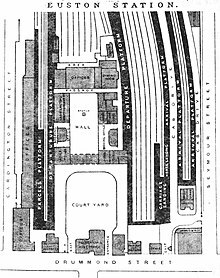 These plans would be pursued during a rebuilding for High Speed 2, the station is served by the Metropolitan, Hammersmith & City and Circle lines, between Kings Cross St.
Manchester Piccadilly is the principal railway station in Manchester, England. 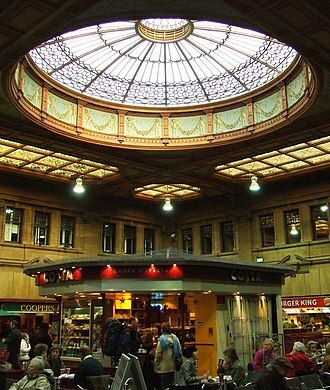 Opened as Store Street in 1842 and renamed Manchester London Road in 1847, the station has twelve terminal platforms in the train shed and two through platforms to the south of it. Piccadilly is a interchange with the Metrolink light rail system. Six train operating companies operate services to and from Piccadilly and it is the second busiest interchange station outside London, with almost 3.8 million passengers changing trains at the station annually. The stations refurbishment took five years and cost £100m in 2002, a TWAO application to build two new platforms was made in October 2016 and construction is expected to commence on completion of the Ordsall Chord in January 2018. 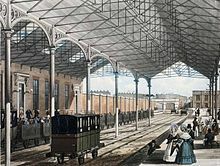 There are plans for five new platforms in the High Speed 2 proposals, a temporary terminus on Travis Street opened in June 1840 when the Manchester and Birmingham Railway opened its line to Stockport. In 1842 the companys Store Street station, consisting of two platforms and offices, adjacent to London Road, was completed and by the line extended to Crewe, the Sheffield, Ashton-under-Lyne and Manchester Railway shared the station from 1844 as the terminus of its line. 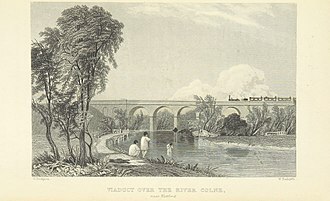 The station name was changed to London Road in 1847 and it retained that name until 1960, in 1849, the Manchester and Lincolnshire Railway, which became the Great Central Railway, was formed. London Road was overcrowded by the 1860s, and the relationship between the companies using it was poor, in 1862 the companies agreed to rebuild the station so it could be split in two. As traffic continued to increase the station was expanded and two added to the train shed in 1881. The MSJAR platforms and the bridge over Fairfield Street were demolished, the adjacent Mayfield station opened in 1910 providing four platforms which alleviated overcrowding at Piccadilly. It closed to passengers in 1960 and closed permanently in 1986, the Mayfield station building still exists and can still be seen on approach to Piccadilly and from platforms 13 and 14. Following the 1923 railway grouping, the station was served by the London and Scottish Railway, after nationalisation in 1948, London Road station was operated as two independent stations, separated by iron railings on platform 5. His rail gauge of 4 feet 8 1⁄2 inches, sometimes called Stephenson gauge, is the standard gauge by name and by convention for most of the worlds railways. George Stephenson was born on 9 June 1781 in Wylam, Northumberland,9 miles west of Newcastle upon Tyne and he was the second child of Robert and Mabel Stephenson, neither of whom could read or write. Robert was the fireman for Wylam Colliery pumping engine, earning a low wage. At 17, Stephenson became an engineman at Water Row Pit in Newburn, George realised the value of education and paid to study at night school to learn reading and arithmetic – he was illiterate until the age of 18. In 1801 he began work at Black Callerton Colliery as a brakesman, in 1802 he married Frances Henderson and moved to Willington Quay, east of Newcastle. There he worked as a brakesman while they lived in one room of a cottage, George made shoes and mended clocks to supplement his income. Their first child Robert was born in 1803, and in 1804 they moved to West Moor and their second child, a daughter was born in July 1805. She was named Frances after her mother, the child died after just 3 weeks and was buried in St Bartholomews Parish Church near Newcastle. In 1806 Georges wife Frances died of consumption and she was buried in the same churchyard as their daughter on the 16th May 1806. 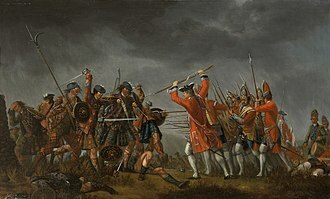 George decided to work in Scotland and left Robert with a local woman while he went to work in Montrose. After a few months he returned, probably because his father was blinded in a mining accident and he moved back into a cottage at West Moor and his unmarried sister Eleanor moved in to look after Robert. In 1811 the pumping engine at High Pit, Killingworth was not working properly and he did so with such success that he was promoted to enginewright for the collieries at Killingworth, responsible for maintaining and repairing all the colliery engines. He became an expert in steam-driven machinery, in 1815, aware of the explosions often caused in mines by naked flames, Stephenson began to experiment with a safety lamp that would burn in a gaseous atmosphere without causing an explosion. The Watford DC line is a commuter railway line from London Euston to Watford Junction. Services on the line are operated by London Overground, the line runs beside the West Coast Main Line for most of its length. The London Underground Bakerloo line shares the track of the line from Queens Park to Harrow & Wealdstone, the London Overground rolling stock used on the line is Class 378 Capitalstar. The DC in the title refers to the fact that the line is electrified using direct current and this was done in the early twentieth century with conductor rails, hence its name in contrast to the more modern overhead alternating current system on the adjacent WCML. Prior to 1912, at time the entire route was finally electrified. The line opened with conventional semaphore signalling mechanically operated from signal boxes at each station, the London and Scottish Railway introduced an automatic electric signalling system in the early 1930s over most of the route and some signal boxes were abolished. A similar system was used for a shorter period between Bromley-by-Bow and Upminster now part of the District line. Signal boxes remaining in use in the early 1970s included, Kilburn High Road Queens Park No.3 Willesden New Station Stonebridge Power House Harrow No. In the early 1980s manual control of signalling was needed for a few months after dragging gear on a train destroyed many electric train-stops which were of a design almost confined to this line. 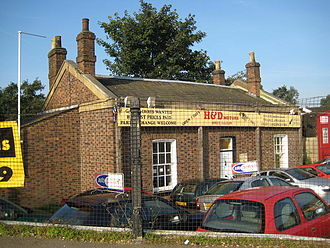 By this time the signal boxes at Stonebridge Power House and Kilburn High Road had been abolished, emergency crossovers at other locations were controlled by ground frames enclosed in structures the size of a garden shed. In 1988 the LMS system was replaced by a standard system controlled from a new signal box, Willesden Suburban. The new system had solid state interlocking, but far fewer signals, in the early 1960s there were headways of less than 2 minutes between Harrow & Wealdstone and Willesden Junction stations, the section of line used by nearly all services. In the early 2000s Willesden Suburban was closed and control passed to Wembley Main Line Signalling Centre, the original electrification was on a fourth rail system, similar to that now used by London Underground, which allowed LER trains to use the new line. 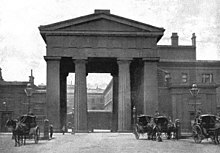 The Euston Arch, built in 1837, was the original entrance to Euston station, facing onto Drummond Street, London. 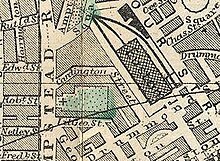 When Euston station was redeveloped Drummond Street was split into two parts either side of the complex, with the eastern half renamed Doric Way. Designed by the architect Philip Hardwick, it was inspired by the Roman architecture Hardwick encountered on a trip to Italy in 1818 and 1819, strictly speaking it was not an arch at all, but a propylaeum of the Doric order. The sandstone structure was designed for the London and Birmingham Railway, complementing Birmingham Curzon Street station, the arch was to be not only a fitting gateway to the Midlands, but to the whole new world which the railway was to open up. The construction of the arch was announced by the directors of the L&BR in a report dated February 1837, The arch was supported on four columns and it stood 70 ft high and 44 ft deep, while the diameter of each of the columns was 8 feet 6 inches. The structure was built from stone from Bramley in West Yorkshire, initially it had very little embellishment and no descriptive title until 1870, when the London and North Western Railway incised Euston on the architrave in letters of gold. There were two lodges on each side of the arch, executed like it in classical style. Each of these lodges was separated from its neighbour by a pair of bronze gates. The gates between the lodges were an entrance for carriages and very heavy goods going by train. The traveller would drive through the arch into an oblong courtyard running north to south, on the eastern side was a range of offices behind a colonnade of pillars. The arch was not admired by everyone in its early years, a guide to London published at the time of the Great Exhibition in 1851 described it as gigantic and very absurd, and placed without reference to the courtyard it leads to. The addition of the name was part of station improvements in 1869–74 which saw the creation of an entrance drive from the Euston Road to the portico. In 1881, the westernmost pier and lodge of the structure were demolished to make way for offices. After returning from a tour of modern stations in the United States, Thomas proposed a large block with wings, which incorporated a hotel, offices. Kings Cross railway station, known as London Kings Cross, is a central London railway terminus on the northern edge of the city. 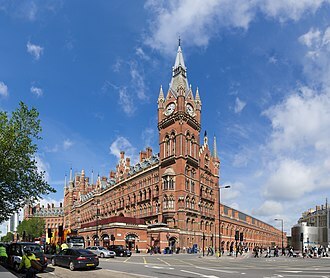 It is one of the busiest railway stations in the United Kingdom, the station was opened in 1852 by the Great Northern Railway in the Kings Cross area to accommodate the East Coast Main Line. It quickly grew to cater for services and was expanded several times in the 19th century. It came under ownership of the London and North Eastern Railway as part of the Big Four grouping in 1923, who introduced famous services such as the Flying Scotsman and Mallard. The station complex was redeveloped in the 1970s, simplifying the layout and providing electric suburban services, in the late 20th century, the area around the station became known for its seedy and downmarket character, and was used as a backdrop for several films as a result. 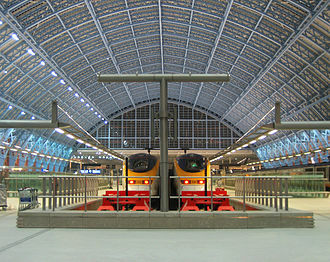 Adjacent to Kings Cross station is St. Pancras International, the London terminus for Eurostar services to continental Europe, beneath both main line stations is Kings Cross St.
Pancras on the London Underground, and combined they form one of the countrys largest transport hubs. The Kings Cross fire at the station in 1987 led to improved fire safety standards across the London rail network. The station is located on the London Inner Ring Road at the end of Euston Road, next to the junction with Pentonville Road, Grays Inn Road. To the west, at the side of Pancras Road, is St Pancras railway station. Several London bus routes, including 10,30,59,73,91,205,390,476 pass in front of or at the side of the station, Kings Cross is spelled both with and without an apostrophe. Kings Cross is used in signage at the Network Rail and London Underground stations, on the tube map and it has been used on official maps from Underground companies since 1951 – the apostrophe was used on them only very rarely before then. Kings Cross is used in the National Rail timetable database and other National Rail railway pages, Kings X, Kings + and London KX are abbreviations used in space-limited contexts. The breakers moved in on 6 November 1961. 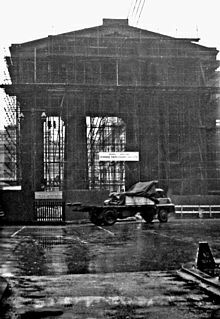 This photograph was taken on a wet 12 February 1962. When the new 'Great Hall' had been completed in 1968 it was found that there was plenty of room after all. Holyhead station in September 1967 under British Rail.